I would be quite pushed to say I'm a Gilly Hicks/Hollister/Abercrombie girl. I do own hoodies and joggers from the brands, but that is pretty much it. I usually find them over priced, and mostly everything I have every bought from them has been in sale. 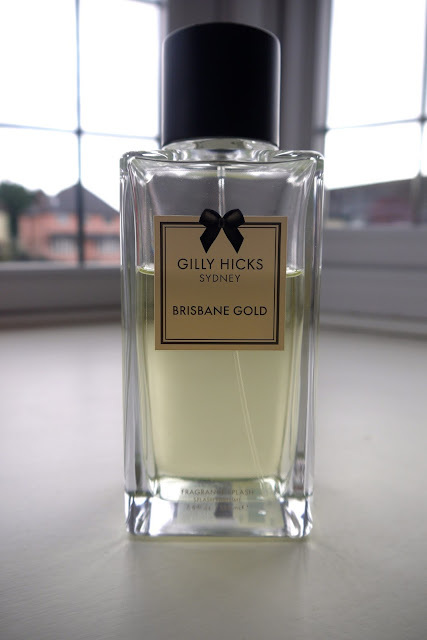 Gilly Hicks is probably my favourite out of the three. It does the lounge wear that I normally purchase from the brands, but also has some lovely underwear. During a shopping trip a couple of months ago in Westfield Stratford City, I ventured to the first floor of the store and was overwhelmed with how great it smelled. I then realised the store has a whole section of fragrance and body products. After taking a very long time to choose (because everything smelt amazing and I couldn't buy them all), I finally decided to purchase the Brisbane Gold Splash. The Splashes retail for £20 and have 250ml of product. It would be nice if they did do smaller sizes though, as these aren't the most handbag/travel friendly of products. As they are not perfumes, they don't last too great it must be said. However, you get soo much that you don't feel guilty for using it often. When I do use it I spray it onto my clothes as they absorb the scent better. The packaging is lovely, simple but very stylish; making these lovely gifts. I honestly could have bought them all, they all smelt so delicious! I will certainly be purchasing another one once this one runs out.